Danaplus was a crustacean-type Hyper-Zoanoid, with segmented armor covered in very long, protruding spikes mainly on his head, shoulders, back and forearms. These spikes or spines could extend at will, and vibrate at frequencies that disrupt the molecular structure of any objects they touch. A large, bulky Hyper-Zoanoid sporting rows of specialized oxygenation "fins" resembling bracket fungus; these serve to create electricity through chemical reactions with the hydrogen in his body, which he expels through the curved horn on his forehead. His entire massive body is in effect a living electrical capacitor; the bursts of power he fires off are like small lightning bolts. An experimental prototype; it somewhat resembled previous Hyper-Zoanoids Derzerb and Zencrebe and possessed thick, dense and very hard armor. It was not (yet) equipped with a specialized weapon, but was considered a promising Hyper-Zoanoid prototype at the time it was destroyed during the first mass deployment of the Libertus Zoanoid. A menacing-looking, armored Hyper-Zoanoid; the crystals embedded in his chest are actually the projection node of an incredibly deadly weapon: the molecular accelerator, a kinetic beam weapon which completely disintegrates matter across about 30 feet! 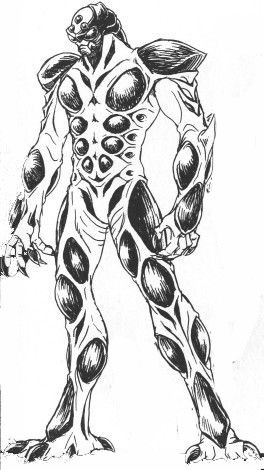 An advanced Hyper-Zoanoid; physically unremarkable, he possessed earlier type Gastal's ability to become undetectable by conventional means (and even the Guyver's alien sensors). In addition to this, he could generate a perfectly spherical, invisible force shield, approximately 100 meters in diameter, which was impenetrable to even the Guyver's weapons; the field even had an abrasive effect, damaging whatever touched it. A unique entity, the Branchai-type was in fact a team of three extremely specialized (Hyper? )Zoanoids working together. Created by the rogue band of Zoalords - Kurumegnik, Jabir and Kabral - this monstrosity was designed explicitly to draw out the Guyver Gigantic into battle with the Zoalord Purgstall. In this capacity, it was completely successful. The "Branchai brothers" actually were brothers, co-engineered to be able to merge into a single being. They could seperate again at a moment's notice, then combine again. Seperately, they were weak, but united, their power was phenomenal (If still vastly inferior to that of the actual Guyver Gigantic it imitated). The Zoanoid referred to by the derogatory name "Marmot" is a prototype power-class Zoanoid developed by Cronos Japan. Only one is ever seen in the Guyver series, having escaped Cronos before his optimization was completed, severely reducing his lifespan. As he fled Cronos Japan, Marmot stole the top-secret Guyver units, hoping to trade them to a traitor within the organisation in exchange for having his humanity restored. What he never learned, however, was that Zoanoid optimization is irreversible. Marmot fled into the woodlands surrounding Mount Narisawa with the three Guyver units, but Cronos sent their agents after him and cornered him. With no way out, Marmot brandished a grenade and set it off, killing himself and scattering the G-units, thus beginning the Guyver series. Last edited by Emerald_Flame300 on Tue May 30, 2017 1:45 am, edited 1 time in total. Two Unus merge into "Dimer configuration"
Three Unas merge into "Trime configuration"
Four Unas merge around Guyot himself into "Quadriga"
.... a giant, spider-like monstrosity which acted as a chariot for the Zoalord! It is as yet unknown what the limits of this combining effect are; it is however clear that the combining geometrically increases the power of the Zoanoids - Dimer was more than twice as powerful as a single Unus. 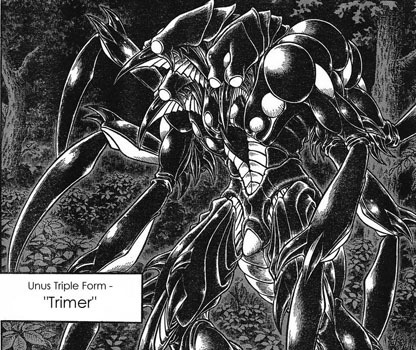 Also unknown is whether the configurations are standard per number of participating Zoanoids; Dimer was taller and bulkier than an Unus, and possessed two arms and two pairs of legs, while Trima had six arms and only two, but very massive legs; and Quadriga, of course, is not humanoid at all. They were developed by Dr. Alfred Hekkaring, a Chronos scientist abducted by Guyver III. The doctor had a personal stake in their creation, since he hated Hamilcar Barcas and wanted to beat him at his own game. He succeeded in creating a form of Zoanoid that has consistently proven to be superior to their Chronos counterparts. The super-Zoanoids are drawn from the ranks of Zeus' Thunderbolt; they are volunteers, although they have not been told the entire truth about their condition. The Libertus Zoanoids with their Bio-Blasters opened. Libertus are substantially stronger than Hyper-Zoanoids, displaying enormous strength even in human form. They have the ability to change their form, adapting to a secondary mode equipped with powerful bio-blasters on their shoulders; they can change back to combat mode at will. They can also transform into a tertiary kamikaze mode; this change is irreversible, since it changes most of the body to an organic explosive, which then explodes. The Libertus pay a high price for their abilities: they have to spend their time off the battlefield in regeneration tanks to maintain their energy levels, and even so their life span is shortened to about two years. Wow.... I didn't realize how much time had passed.... My last post was on May 29th, 2017. I honestly haven't played M&M in a long time. My gaming group collapsed and real life smacked me in the face. I recently saw the new Iron Man anime and it started my brain thinking about my old builds. Hopefully in the near future I will have more new builds. I must first give credit to KorokoMystia for the Tequila Gundan build. I "borrowed" some design ideas from that build. I give full credit to KorokoMystia for those aspects. NOW.... having said that, here is my build for a "Standard-ish" Gundam from the Stardust Memories series. This is the first of hopefully multiple builds. I have always liked the trope of giant robot anime. This version of a Gundam Mobile Suit is heavily armored and armed. In the series, I believe that it carried a nuke. Yep, that rocket laucher could be loaded with a nuclear shell.